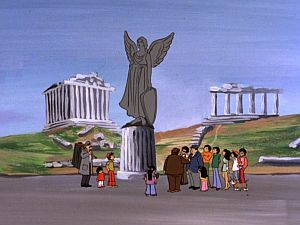 Charlie Chan and the Chan Clan step into find the statue of the Winged Venus of Athens that has been mysteriously stolen, replaced by a plaster copy. The Parthenon - An ancient Greek temple on the Acropolis, overlooking the city of Athens, Greece. The Parthenon, dedicated to the Greek goddess Athena, was completed in 438 BC. Henry Chan: "That's right, Scooter, the name of the building is the Parthenon." The Parthenon, and as portrayed in The Greek Caper. Oracle of Delphi - Dating back to 1400 BC, the Oracle of Dephi was built around a sacred spring. Delphi was thought to be the “navel,” or the center, of the world. In ancient times, people traveled great distances to have their questions about the future answered, usually in very cryptic terms, by the Pythia, the priestess of Apollo. Tom Chan: "Therefore, let us do what the Greeks do, ask the Delphic Oracle."